Succulent free range British pork, from pigs sired by pedigree Hampshire boars. Hampshire breed pork is renowned for tenderness and superb flavour, and our Hampshire sired free range pork is bred for succulence. It's reared by carefully selected specialist farms in Norfolk, Suffolk and Wiltshire, where the pigs spend their entire lives outdoors, with straw filled arcs and tents for shelter. Grill Time: 15-20 mins. Grilling Instructions: Preheat grill. Remove all packaging. Place under a preheated medium grill, turning occasionally until thoroughly cooked and the juices run clear. 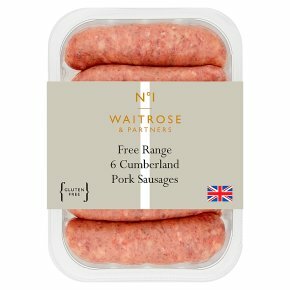 As these sausages have natural skins there is no need to prick them.